Beautiful bougainvillea, that evergreen subtropical plant from South America, comes in several different forms. The most common is a vine – a vine that does not twine or cling – but a vine nonetheless. It also comes in a shrub form and a ground cover. The vibrant colors are not the flower, but are colorful bracts surrounding a small, inconspicuous flower. The color show begins in spring and can continue into the winter. Now, you can’t ask much more of any flowering plant! A mature vine bougainvillea in full bloom is simply a huge “WOW” factor in any garden. 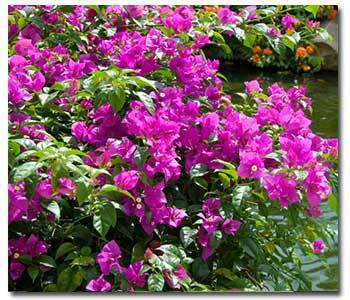 The vine bougainvillea is a fast grower and needs regular pruning to keep in good form. Because of this vigorous growth, any structure chosen for support must be very sturdy. Yes, they do have thorns. Keep that in mind when you are thinking of the best location in your landscape. Other bougainvilleas have a low-growing form which is perfect for containers. Place containers near the edge of a balcony and the bougainvillea will grow outward and down, spilling color over the outside wall of your home. Great care must be taken when planting bougainvillea. The roots do not like much handling so do not disturb the root ball. You can cut out the bottom of the pot and plant both bougainvillea and pot. Alternatively, carefully make four vertical cuts down the side of the nursery container and carefully pull all four sides farther apart. Gently remove the plant from the growing container from the base of the root ball (not the trunk of the plant) and carefully place it into the ground or new container, remembering that the roots are very sensitive to handling. Bougainvilleas like full sun and regular watering. If you water too much, they won’t bloom. They are very drought tolerant once established. Bougainvilleas come in white, yellow/orange, pink, red, and purple. Plant all one color for a huge color impact, or mix and match colors, to create the look of an impressionist painting.